Lance Martinez of My Detroit Sports sends along this original photo of Hawks guard Dennis Schroder signing autographs, prior to a recent game at the Pistons new home, Little Caesars Arena in midtown Detroit. 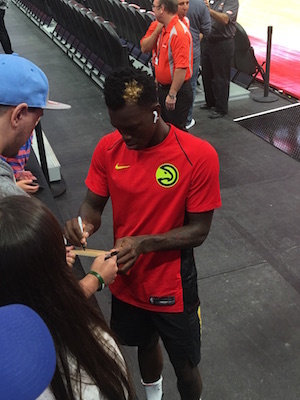 Schroder, a native of Germany, is now in his fifth NBA season, all of which have been in Atlanta. Prior to beginning his NBA career, the 24-year-old played professionally in the German League. Schroder has helped the Hawks reach the playoffs in each of his first four seasons, with his points and assists totals going up in every successive year. So far in this young season, Schroder is playing the best he has ever played, scoring 22.6 points and dishing out 6.6 assists. Despite his high level of production, the rebuilding Hawks are only 2-10, good for last place in the Eastern Conference.